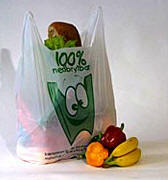 Recyclaholics' plastic bags are made from vegetable-based polymers, which contain zero or negligible amounts of petroleum. When used in a proper composting environment, they will break down into carbon dioxide, water and natural minerals in approximately 10 to 45 days. Our bags range in size from about 2 gallon (8 liter) to 64 gallon (240 liter). Most are designed to fit standard waste containers. Handled grocery bags are also available. We offer custom printing and manufacturing too. All of our bags are certified to be 100% compostable and fully compliant with the ASTM D6400-99 standard, which assures that they leave no known residues in the ground or water supply. These bags carry the seal of the US Composting Council. Volume discounts are available. Click here for a price list. Contact us for a quote: (612) 521-LOOP or via e-mail. To place an order, or to find out more, click here or call (651) 216-0110.